Being a scientist in the Age of Settled Science is a precarious occupation simply because submitting an honest scientific paper for peer-review can get you de-funded and/or branded a heretic by the academic gatekeepers that police the publication process. Therefore, scientists are frequently obliged to compromise and prioritise for publication. This leads to the bizarre situation where published observations may show that 1 + 1 = 2 while the associated conclusions conform to the Settled Science where 1 + 1 = 5. In other words: Follow The Data. On the other hand, being a Settled Scientist is a lot safer because they simply ensure the information submitted for publication supports the Settled Science that 1 + 1 = 5. The level of academic misdirection is particularly extreme in the [largely oxymoronic] Earth Sciences where Settled Scientists prefer to inhabit virtual reality safe spaces [aka computer models] instead of venturing out into the real world where they might get their hands dirty. However, everything is not lost in the Earth Sciences because there are still some scientists left who are willing to push the envelope by venturing out into the real world. Dallas Abbott is a scientist who has advanced the boundaries of knowledge by venturing out into the real world [H/T Saucy Chaucer]. “Many of us think Dallas is really onto something,” Dr. Ryan said. Dr. Alvarez, a professor of earth and planetary sciences at the University of California, Berkeley, spent a decade convincing skeptics that a giant asteroid wiped out the dinosaurs 65 million years ago. Unsurprisingly, her work on impact sites and mega tsunamis has made waves. In southern Madagascar we have documented evidence for tsunami wave run-up reaching 205 m above sea-level and penetrating up to 45 km inland along the strike of the chevron axis. Subtly the orientation of the dunes is not aligned to the prevailing wind direction, but to the path of refracted mega-tsunami originating from Burckle impact crater. The results of our study show that substantive oceanic comet impacts not only have occurred more recently than modeled by astrophysicists, but also that they have profoundly affected Earth’s natural systems, climate, and human societies. The Fenambosy Chevron is one of four chevron-shaped land features on the southwest coast of Madagascar, near the tip of Madagascar, 180 meters (590 ft) high and 5 kilometres (3.1 mi) inland. 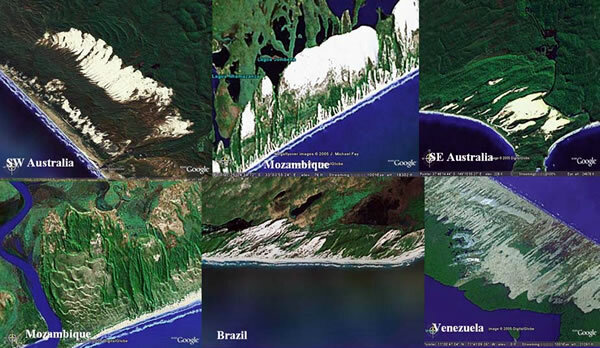 Examples of chevron dunes from different parts of the world ocean coastline. They reach heights of more than 100 m with in-land penetration of up to 10 km and believed to be a result of impact of destructive oceanic waves with possible later modification made by wind. Must: Mandating theories “must” be right. Might: Peer-Review censorship and consensus corralling. Money: De-funding, defaming and decommissioning. In 2009 Bourgeois and Weiss employed “reason” and argued “by modeling”. We reason that chevron-type bed forms are common and are present far enough from the coast to preclude tsunami genesis. Moreover, we argue that “chevrons” are not mega-tsunami deposits by modeling tsunami behavior and evaluating sediment-transport conditions under which such features formed. We model the southern Madagascar case, with an impact source in the Indian Ocean, and show that a modeled wave approach is inconsistent with “chevron” orientation. However, the megatsunami origin of the Fernambosy and other chevrons has been challenged by other geologists and oceanographers. In 2015 J. Hansen et al declared chevron beach structures “must” be formed by storms. The Eemian-age chevron beach structures with consistent southwesterly direction throughout windward shores in the Bahamas, with wave runup deposits at elevations as much as 20–40 m above today’s sea level and reaching as far as a few kilometers inland, must have been formed by massive storms in the direction of the prevailing winds. Dallas Abbott’s adventures probably begun in earnest at the Atlantis Conference in 2005. We have found an impact crater that is likely < 6000 years old. Burckle crater is in the central Indian Ocean on the edge of a fracture zone at 30.87° S 61.36°E. The crater is 29±1 km wide and is the inferred source of layers with high magnetic susceptibility in 3 deep sea cores. Each layer goes to the top of the core. Two out of 3 of the cores have basal Pleistocene ages and the basal age of the third is unknown. The high susceptibility layers contain broken plagioclase, spinel periodotite, and chrysotile asbestos. One sample contains pure Ni with drops of oxidized Ni. Because pure Ni melts at 1453°C, it is very likely that the drops formed during an impact. The high susceptibility layers from 2 cores are over 5 times thicker than they should be for a 29 km wide source crater. We also find that a 29 km wide source crater cannot vaporize enough seawater to produce meters of rain, even in a restricted region between 4750 and 7250 km from the crater. Thus, we infer that Burckle crater was produced as part of a Shoemaker-Levy type impact of a comet. The fragmented comet also produced two other large impact centers, one in the northwest Pacific and another in the central eastern Pacific. Where the rainout from these impact centers overlaps, we see deluge events that are over a week long. The impact event also produced devastating tsunamis, winds, and associated social upheaval. We date the event to around 2807 B.C. Paired open red circles: Each set of circles is the same set of distances from a central point. The inner circle is 4750 km away and the outer circle is 7250 km away. Distortion is due to use of a mercator projection. Red square: center of a set of paired circles. Solid red circles: locations with deluge legends. Blue circles: locations of chevrons attributed to megatsunami events. Small green circles: locations with tsunami legends. (A) Two sets of paired red circles are shown, one for Burckle crater and another for an inferred strike in the equatorial Pacific. (B) Two sets of paired circles are shown: one for Burckle crater and another for an inferred strike in the ocean just off Kamchatka. Solid yellow circles: areas where deluge legends report a deluge lasting more than 7 days. Note that yellow circles are either in areas where sets of paired red circles overlap or just west of these areas. 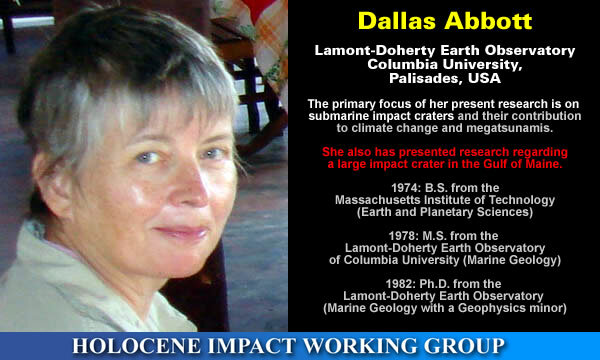 Burckle Abyssal Impact Crater: Did this Impact Produce a Global Deluge? This Conference aimed to serve as a forum for the presentation and constructive discussion of all the issues related to the hypothesis of the lost land of Atlantis. The purpose of the meeting was to gather specialists of all the different disciplines involved in highlighting the scientific aspects of this fascinating subject. Being a smart scientists Dallas Abbott began joining up the dots around the Indian Ocean. The melting temperature of pure Fe is 1535 °C. These temperatures do not occur in sedimentary rocks. Because the grain shapes indicate that the native Fe was deposited immediately after it solidified, we propose that the iron melted during a nearby impact event. The melt flew through the air and was deposited either as broken grains or bulbous drops. Native Iron in the Chaibasa Shales: Result of a Pre 1.6 Ga Impact? 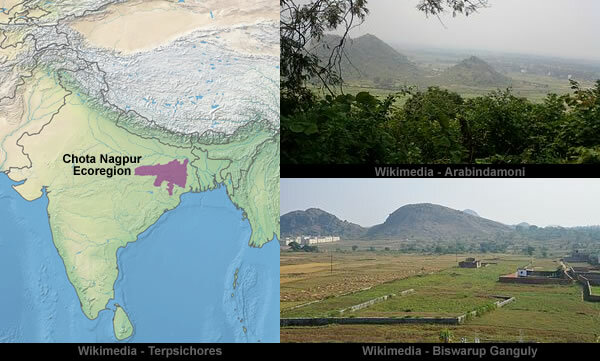 The Chota Nagpur Plateau is a plateau in eastern India, which covers much of Jharkhand state as well as adjacent parts of Odisha, West Bengal, Bihar and Chhattisgarh. 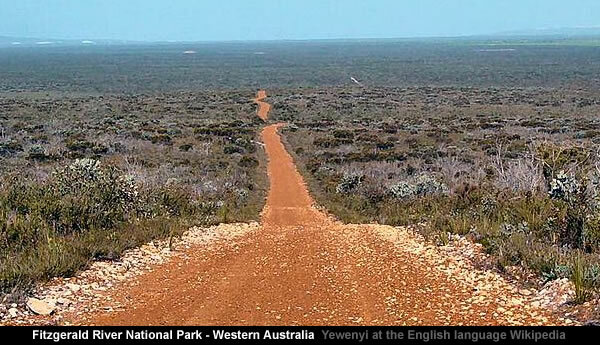 It is part of the Deccan Plate, which broke free from the southern continent during the Cretaceous to embark on a 50-million-year journey that was violently interrupted by the northern Eurasian continent. The northeastern part of the Deccan Plateau, where this ecoregion sits, was the first area of contact with Eurasia. The Singhbhum area contains much more hilly and broken country. The centre of the area consists of an upland plateau enclosed by hill ranges. This strip, extending from the Subarnarekha River on the east to the Angarbira range to the west of Chaibasa, is a very fertile area. Although the verbiage of the Native Iron in the Chaibasa Shales paper [above] happily conforms to the Settled Science regarding Native Iron it’s important to Follow The Data because superficial Native Iron deposits with a nickel content above 0.37% in all probability originated in the iron-nickel core of another planetary body. 1) Iron embedded in terrestrial rocks is Telluric iron. 2) Iron meteorites must contain more than 3% nickel. Type 1 Telluric iron is specified so it can explain away the large iron meteorites. Type 2 Telluric iron is specified so it can explain away the embedded fragments of iron meteorites. The geologic theologians have also found it necessary to whimsically promulgate that many minor meteoric minerals, such as cohenite, are also terrestrial minerals. Furthermore, these mainstream explanations will struggle to explain the nickel content of Telluric iron because the estimated elemental abundance of iron and nickel in the Earth’s crust suggests an average nickel content of [somewhere] between 0.14% and 0.37%. b) Originated in the iron-nickel core of another planetary body [and arrived as iron meteors which catastrophically fragmented in the Earth’s atmosphere]. 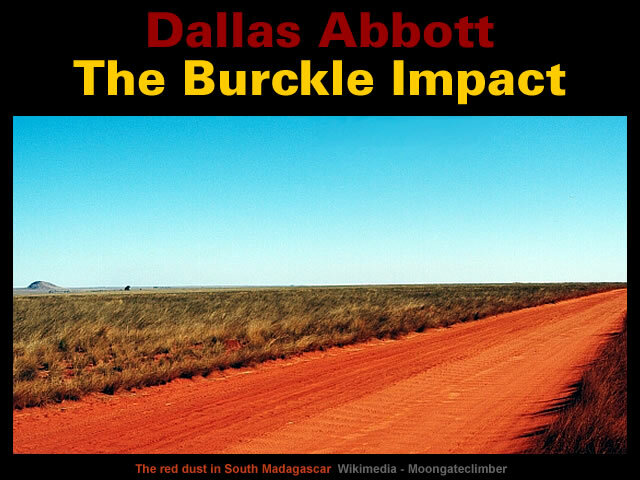 Overall, Dallas Abbott managed to effectively join up many of the impact dots that are embedded around the Indian Ocean. Chevrons are enigmatic yet understudied sedimentary structures. This paper presents a comprehensive description of chevrons along the world’s coastlines, and with use of Google Earth, 221 chevron sites were identified. Although morphologically variable, chevrons all show lancet-like forms at different shoreline angles. Their origin could only be wind or waves driven. Although many chevrons resemble narrow parabolic coastal dunes, a young aeolian genesis can be excluded where orientation contradicts main wind direction, or where no beach or sand deposit exists. Where storm origin can be excluded due to chevron height and extension far beyond storm wave reach pre-historic tsunamis were considered. Scheffers, A.; Kelletat, D.; Scheffers, S. R.; Abbott, D. H.; Bryant, E. A. However, it appears very likely that Dallas Abbott Followed The Data and realised that something isn’t quite right with the mainstream geological timeline for the Indian Ocean. Firstly, there is the very remarkable absence of chevron beach structures around the Bay of Bengal and all along the south coast of the Indonesian archipelago. Secondly, there are evident mismatches between the identified deluge legend locations are the chevron beach structures. 2) The relative positions of the Impacts Sites and the Beach Chevrons have changed [sometimes very significantly] since [for example] the Burckle Impact in about 2,807 BC. The realisation that something isn’t quite right with the mainstream geological timeline is further reinforced by the curious 1st millennium history of Madagascar that spans the Indian Ocean – just like the red sand band that spans the Indian Ocean. Human settlement of Madagascar occurred between 350 BC and AD 550 by Austronesian peoples arriving on outrigger canoes from Borneo. These were joined around AD 1000 by Bantu migrants crossing the Mozambique Channel from East Africa. Gallery | This entry was posted in Arabian Horizon, Astrophysics, Catastrophism, Dallas Abbott, Geology, Heinsohn Horizon, History, Inflating Earth, Science. Bookmark the permalink. The problem with tsunami deposits is the mechanics of the process. Tsunamis travelling in an ocean are not carrying sediment – they are simply a powerful wave in water. On landfall the tsunami wave becomes destructive but it’s principally a picking up of flotsam and drowning the area in front of the wave landfall. Picking up rock and debris? Not observed. I’ve studied the monsoon working of Kimberley Region rivers in Western Australia and even at intense tropical monsoons, wildly flowing rivers, all these manage are to transport loose artefacts and silt and clay fractions, but no wholesale movement of sand to gravels are observed. It’s another classical geological fallacy of arguing the consequent and thinking with a limited number of ideas. If all you have is a hammer, everything then becomes a nail. I watched the latest episode of the Star Wars movies, Rogue One the other night. The Empires destruction of the city on the moon Jedha is a remarkable facsimile of a planetary thunderbolt impact and it’s related after effects, give or take a couple of imaginative constructs. The lateral movement of rocks and fractured rock radiating outwards via what physical process? Simple atmospheric turbulence? If we add plasma to the mix, we now have a surface turbidity current or mass that will exhibit all the features of hydraulic transport with the transport medium not being water, but electric-plasma produced by the Death Star. It is interesting that the Star Wars meme involves enormous planetary scaled thunderbolts, whether in Rogue One, the previous episode of the wakening of The Force, or some of the later James Bond movies involving satellite powered discharges etc. Our species reliving what the Earth experienced in the past? Shades of Mankind in Amnesia. Picking up rock and debris? Not observed. Dallas Abbott sees it differently. Perhaps the most dramatic deposits are those containing piles of imbricated boulders (Fig. 3). These piles take many forms, but include boulders up to 105 m3 in volume and weighingas much as 285 tons. 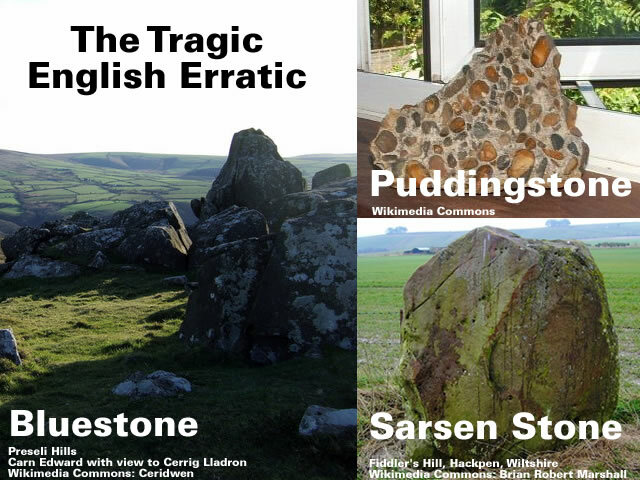 The boulders lie en echelon one against the other like fallen dominoes, often in parallel lines. At Jervis Bay, New South Wales, blocks weighing almost 100 tons have clearly been moved in suspension and deposited in this fashion above the limits of storm waves on top of cliffs 33 m above present sea level. 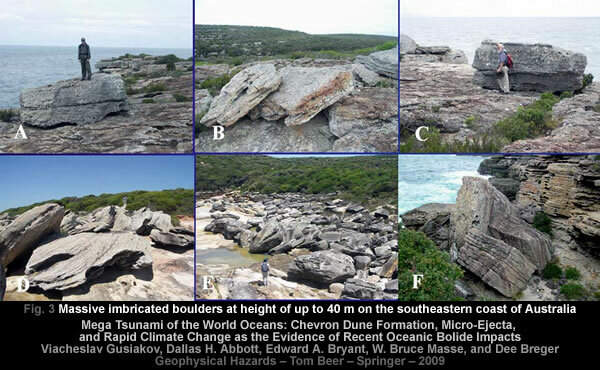 The longest train of imbricated boulders exists at Tuross Head where 2 to 3 m diameter boulders stand as sentinels one against the other, over a distance of 200 m at an angle to the coast (Young et al. 1996). Do we have any photos or mappings of these impacts? There is a famous large boulder/rock on the wave-cut platform at Bondi that mysteriously disappeared overnight during a storm, only to reappear during a subsequent storm. This happened during the 1930’s if memory serves me. During 1969 I was sampling an offshore rutile deposit off Tweed Heads in northern NSW at 6 fathoms depth, while active beach mining for rutile occurred at the existing beach strand line, while an older strand line existed further inland. The question then is did sea-level rise or did the land rise or fall, and how could one tell? I would expect tsunami generated deposits to be chaotic deposits ranging from silt to massive boulders and everything in between size wise. Isolated erratics do not fit this mechanism since it is unlikely a tsunami would transport one or two erratics in isolation. Lifting large boulders under water next to a wave cut platform, as at Bondi or Jervis Bay, seems a bit of a problem if water is the only mechanism. However as thunderstorms, or storms in general are also electrical phenomena, then perhaps excessive negative electric charges might have had an effect making large boulders weightless and this more easily moved than under electrical neutral and fair weather conditions. Rapidly flowing water tends not to excavate or loosen bedrock – turbulence achieves that and the tsunamis we have observed, while moving artefacts on the surface, also pick up flotsam but have not picked up or comprised of sediment charged surficial turbidity currents. It is well known that there is a laminar flow structure in fast flowing water at its bedrock interface. Whether that laminar flow is the result of Pollackian EZ water, or some other factor remains to be determined, but laminar flow, which is more or less what a tsunami ends up being, is not a viable erosional force despite the surficial damage of artefacts left behind. Tsunamis do transport sand and gravel, as has been well documented with recent post-tsunami surveys. However, that does not make chevrons (mega-) tsunami deposits. Oh, pay attention to the literature and documentation of boulders being moved by storms, even in places with not-such-superstorms such as eastern Sicily. Do you mean like this??? It would help if references could be supplied, specifically eye-witness accounts of this phenomena.